I have wide, flat feet, which makes finding any workout shoes a challenge. I also do cardio 6 days a week and lift legs 2 days a week, which has killed my last 2 pairs of gym shoes after 6 months. So now I bought lifting and running shoes. I’ve gone through a succession of running shoes that I thought felt amazing at first and progressively got worse and worse. Before I started lifting, I got about a year out of a pair. But with the lifting, that cut the shoe life in half. Oh, and I get gnarly callouses that require periodic pedicures. My wife enjoys me coming to the nail salon with her where I happily pay a nice lady to take a cheese grater to the bottoms of my feet. 1. Saucony Stabil CS3 - a super beefy “motion control” shoe from when I was still fat and needed all the help I could get. After I lost a bunch of weight, they were just too chunky. 2. New Balance 860v6 - a lighter weight stability shoe that still had decent support for my flat feet. 3. 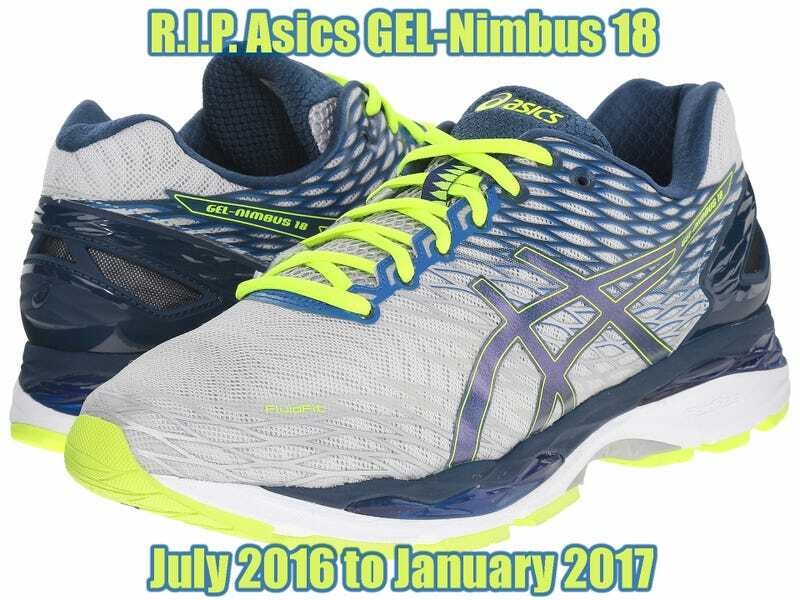 Asics GEL-Nimbus 18 (pictured at the top of this post) - a more cushioning focused shoe with some stability thrown in. I loved the cushion on these but my running pace went down compared to the 860v6 because they were too soft. Now that these are nearing their end, and also because I squat and deadlift better in bare socks than cushioned running shoes, I picked up some New Balance 1267 cross trainers for lifting. While it might be hip and cool to lift in CrossFit weirdo cult member shoes like Reebok Nanos or Innov-8s or Nike Metcons, I need the damn extra-wide 4E width. I even tried the NB cult member shoes, which came in a 2E width, but no dice. At least the 1267s have some neon green on them and don’t look entirely like dad shoes, like say, these. So that solved the lifting shoe need (at least it will once UPS Ground finally delivers them to me next Monday) but my runners are still shot. So today I went and tried on a bunch of runners. It came down to the updated New Balance 860v7, or the Asics GT-2000 5. Both of which are light-stability shoes like the 860v6 I had before, except gray and ugly. It was a bit of a toss-up, so I went with the GT-2000 5, because they were at the same store where I got my GEL-Nimbus 18s, and they have this deal where if you buy one pair of shoes at full price, your next pair is half off. They ended up being $60 instead of $125 for the 860v7s. Hopefully, now that I won’t be lifting in my running shoes or running in my lifting shoes, they’ll last longer.